BUFFALO, N.Y. — Chewing: We don't think about it, we just do it. But biologists don't know a lot about how chewing behavior leaves telltale signs on the underlying bones. To find out, researchers at the Jacobs School of Medicine and Biomedical Sciences at the University at Buffalo have been studying the jaw joints of carnivorans, the large mammalian order that includes dogs, cats and bears. Last week, the scientists described results that they didn't expect to find. In the paper, published online on Aug. 24 in PLOS ONE, they reported that the jaw joint bone, the center around which chewing activity revolves (literally), appears to have evolved based more on an animal's size than what it eats. 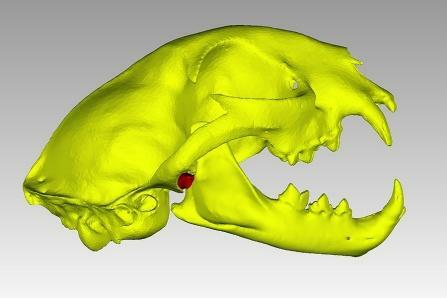 "Even though it is clear that the carnivoran jaw joint is important for feeding, no one knew if jaw joint bone structure across species was related to the mechanical demands of feeding," explained M. Aleksander Wysocki, first author and a doctoral student in the new computational cell biology, anatomy and pathology graduate program in the Department of Pathology and Anatomical Sciences in the Jacobs School. "The mandibular condyle is the pivot point of the jaw, it functions similarly to the way the bolt of a door hinge does," Wysocki said. "Studies have shown that this joint is loaded with force during chewing." He noted that the team was especially interested in the intricate, spongey bone structures inside the jaw joint, also known as trabecular bone. "We thought that this part of the skull would be the best candidate for determining relationships between food type and anatomy." For example, because hyenas crush bone while consuming their prey, it could be assumed that their jaw joints would need to be capable of exerting significant force. "On the other hand, an animal that eats plants wouldn't be expected to require that kind of jaw joint structure," he said. "But we found that diet has a weaker relationship with skull anatomy than we thought. Mostly it's the animals' size that determines jaw joint structure and mechanical properties." The researchers took computed tomography (CT) scan data of skulls from 40 species at the American Museum of Natural History, then built 3D models of them, from which they extracted the internal bone structure. Using a 3D printer, the scientists then printed 3D cores, based on virtual "core samples" taken from the mandibular condyle of each jaw joint, which they then scaled and tested for strength. "The mandibular condyle absorbs compressive force during chewing so we hypothesized that this was a part of the skull that was likely to be influenced by what the animal eats," Wysocki said. "It turns out that body size is the key factor determining the complexity of jaw joint bone structure and strength." "Still, given how critical the temporomandibular joint is in capturing prey and eating it, these results are very striking," he said. "For over a century, it has been assumed that skull shape is closely related to what an animal eats. And now we have found that jaw joint bone structure is related to carnivoran body size, not what the animal is eating." Wysocki said that the reasons for this apparent disconnect may be that larger carnivorans don't need such powerful jaws because they are proportionately larger than their prey, or possibly because they share the work involved by hunting in groups. He also said that other factors such as developmental constraints of bone structure could play a role in producing the trends observed in the study. "Our research shows that factors other than diet need to be considered when attempting to understand jaw joint function," Wysocki concluded. "It turns out that the functional anatomy of the jaw joint is much more complex than we thought."